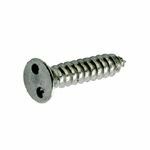 Two Hole Screws which are often referred to as Snake-Eye Screws, twinhole screws, Pig Nose Screws or Pig Nose Bolts are a favourite of Architects & Designers in view of their aesthetic appearance. 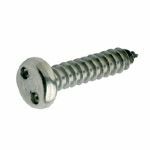 These versatile security screws are ideal for a wide range of applications and are often used to secure glass panels and signage in place in both indoor and outdoor locations. The attractive appearance of these two hole snake eye screws make them a firm favourite with architects and designers as well as users. 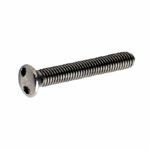 Our stock range of two hole screws include; self tapping snake eye screws and metric machine screws, including the ever popular raised countersunk electrical screws. We are also able to supply bespoke manufactured Pig Nose Bolts to your specified requirements, but these are obviously subject to a small manufacturing lead-time. 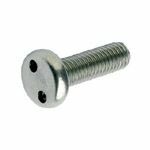 Bespoke pig-nose screws and bolts, can be produced in small quantities if required, so if you have an application which would benefit from the aesthetic presence of these attractive fastenings please call us for details of price and manufacturing leadtime. 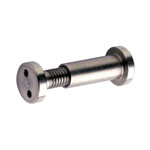 Two Hole screws are used for a wide range of safety and security applications. They are a popular choice for securing various types of panelling in position. 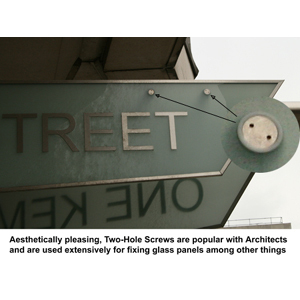 This modern, glass building sign, is secured with Two Hole Screws (see inset picture for detail), while Glass Stair Rail Panels or Balcony Panels are also typically fixed in position with this type of screw. They are also a popular choice for high profile applications such as securing the decorative metal lining panels installed in public areas at some refurbished London Underground stations. Because these versatile security fixings are manufactured from stainless steel, they are ideal for internal or outdoor applications. Bespoke manufactured mating Two-Hole Machine Screws and Barrel Nuts as shown here, are widely used for securing glass panels in position. 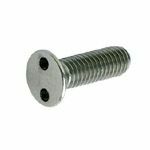 These screws require a matching Two Hole Security Driver to install or remove them, which must be ordered separately. Tooling options for snakeye Screws include; Two Hole Security Driver Bits and a One Piece Two Hole Security Screwdriver.